Within Teamwork Projects, you can upload files of up to 2GB to your Projects site. Uploading large files can take some time and will be dependent on your internet connection and available upload speeds. Note: The available space you have for uploading files is related to the plan you are subscribed to. The overall remaining file storage space across all of your projects is available to view in the panel on the left of the files area of any project, and you will see the details of the space taken by your uploaded files in this project and in total there, too. Administrators can see a summary Usage Report of all projects and how much space each uses, in your Subscription settings. Click your profile icon in the top right of your site, and select Subscription from the dropdown menu. In the Storage section of your plan summary, click on the % available link to view the usage report. The usage report will show a breakdown of each project and the amount of space it is using. You can also export the report to PDF using the export link in the top right. 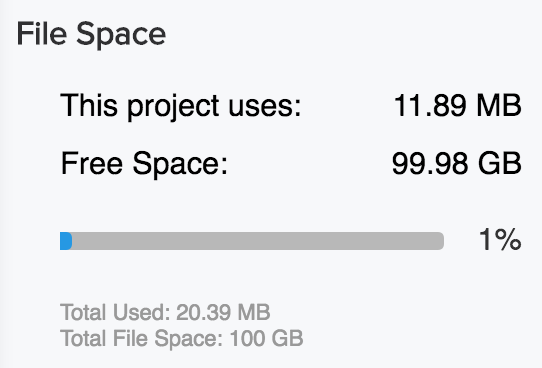 Note: Space will still be used by files uploaded to projects that are archived. You'll need to reactivate a project to delete the files in it.